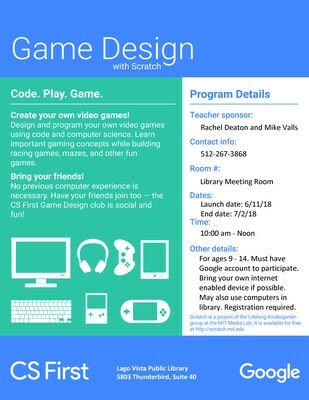 Create your own video games! Design and program your own video games using code and computer science. For ages 9-14. Must have Google account to participate. Bring your own internet enabled device if possible. May also use computers in library. Registration required. Launch date: 6/11/18 End date: 7/2/18.